It’s a common misconception that people on a Low Carb Diet (or Atkins) mainly eat bacon, grease, processed cheese and Atkins bars/shakes. While you can, and some people do, you can actually eat VERY healthy on a Low Carb Diet. It’s great for weight loss, but there are many other health benefits to this way of eating. It has been proven to help with arthritis, inflammatory diseases, fibromyalgia, diabetes, high blood pressure, and a number of other issues. I’ve been eating low carb for three years now, and I’ve never actually done the Atkins phases. I keep it really simple and just stick to 20 Net Carbs per day. (“Net Carbs” is Total Carbs minus Fiber.) I aim to eat most of my carbs in green vegetables, so my diet is mainly “meat & greens” plus healthy fats. The Low Carb Diet is often referred to as “LCHF” which means “Low Carb, High Fat”. There is a science to the way it works, which boils down to Food Combining. If you consistently eat 20 net carbs a day, your body switches from burning carbs/sugar for energy, to burning fat for energy. If you eat low carb AND low fat – your body won’t know what to burn for fuel. Which is not a good thing. 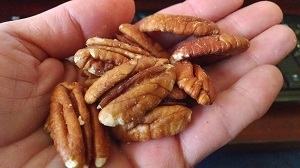 Read: 6 High Fat Foods That Are GOOD For You! Spinach, salmon, avocado & mushrooms are top low carb sources for potassium. I am not a huge fan of spinach by itself with Birdseye Creamed Spinach being the exception to the rule (yum! ), so I “hide it” in all kinds of foods to make sure I eat plenty. I add spinach to omelets or scrambled eggs. I add a handful of chopped or creamed spinach to my meat when I make hamburger steaks. I even put it in my low carb biscuits! It’s easy to “sneak in” plenty of spinach! What are YOUR favorite healthy fats & super foods? I eat out & order take-out a lot, but I always make sure to order my salmon with “no sauce” or “no glaze” or ask how it’s cooked. Be cautious about sweet glazes that some restaurants add! The Fuji Japanese Restaurant here in my area has a great grilled salmon AND an Avocado Salad. 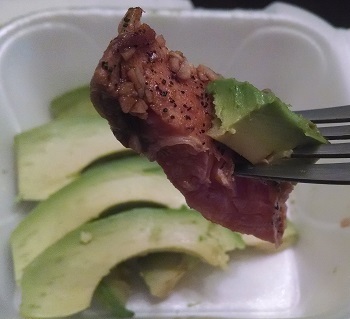 I’m hooked on eating the salmon & avocado together as a super healthy (and easy) take-out meal.